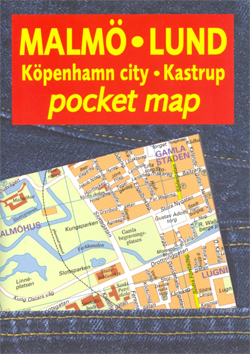 Malmö and the nearby Lund in an indexed pocket street atlas fro Liber Kartor, with diagrams of local bus and train lines, plus a street plan of central Copenhagen and the city’s international airport at Kastrup. All the plans are at the same scale of 1:12,000. There is no map legend, but the plans are self-explanatory. Diagrams show main bus lines in both cities, as well as the region’s rail network. 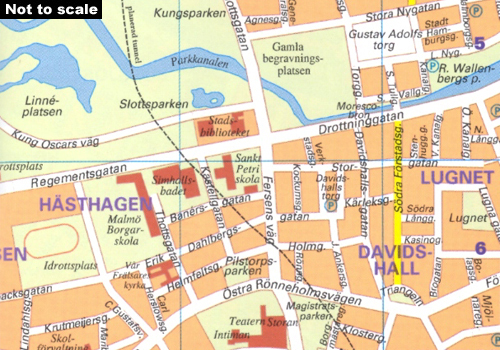 Also included is a small inset showing the location of the tourist information office and the toll barrier on the Swedish side of the bridge linking Malmö with Denmark.